Devonshire, one of Britain's largest remaining freestanding cabinet furniture makers and importers, has promoted Andy Waddell to md, replacing its founder and co-owner. Chief executive Hamish Paton is to leave rent-to-own furniture and electricals retailer BrightHouse for a new role, sparking a search for a successor. Debenhams' chairman Sir Ian Cheshire and CEO Sergio Bucher were today (Jan. 10) voted off the board by shareholders in a move that could impact existing plans for a solvent turnaround of the business. Debenhams said it "reinstated some tactical promotional activity in order to be competitive" as it narrowed the pace of sales decline over the Christmas period. DFS chief financial officer Nicola Bancroft is to step down from full-time executive duties, sparking a recruitment process for her successor. DFS said sales advanced as all its brands delivered growth in the five months to December 30, with the sofa market leader adding that history suggests it will take advantage of any market turmoil. Clothing and home sales declined mid-single digits for Marks and Spencer in the retailer's third quarter as it upped the pace of store closures and reconfigured its non-food strategy. High-end bed maker Vispring has laid the groundwork for widespread sales growth overseas after agreeing a formal distribution contract with France's largest bedding retailer. The companies shortlisted for The Furniture Awards 2019, the winners of which will be announced at the January Furniture Show later this month, have been named. Hayche, the furniture company led by a well-known former Made.com and Marks & Spencer buyer, is equity crowdfunding and is encouraging people from across the trade to take part. Samson Holding would consider selling either the Willis & Gambier brand or the entire UK warehousing operation, its finance director has said. Dwell founder Aamir Ahmad says he decided to step down as CEO to focus on new group projects, with the furniture retailer's parent DFS hiring from outside the sector for his successor. J Sainsbury, parent to Argos and Habitat, claims it has made market share gains across general merchandise categories despite a fall in sales in the run-up and immediate aftermath of Christmas. John Lewis & Partners kicked off 2019 with double-digit sales growth on the back of rising sales across all three of its main categories. Home returned to growth after five straight declines. Far East furniture conglomerate Samson Holding has announced the planned closure of its Peterborough based case goods division Willis & Gambier, citing "challenging market conditions with little sign of clarity." Tempur Sealy International has appointed the head of its Tempur UK operation to a newly-created position. Sales advanced again for The Conran Shop's UK retail operation, which takes in its fast-growing ecommerce business as well as stores at Chelsea, Marylebone High Street and Selfridges. Higher costs offset rising output at The Conran Shop as the furniture and design retailer booked a wider loss on higher sales in 2017–18. The main trading arm of Seconique, one of the UK's biggest furniture importers, made revenue gains as it moved to its new West Midlands home. Dunelm managed to transition sales from its now-closed Worldstores business to its main dot com website while store sales benefitted from reserve and collect orders. Sales growth accelerated for Dunelm in the retailer's second quarter as it managed to transition sales from its now-closed Worldstores brands to its main website. It also said the failure of the main Fogarty licensee will impact profits. JYSK has named the locations of its first four Irish stores, all of which will be open by the summer of this year. Danish value furniture retailer JYSK, which last year announced plans to launch in Ireland, has named the locations of its first four stores in the country, three of which will be opening in the spring. 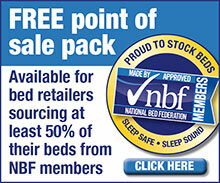 Silentnight, Britain's biggest bed maker, is to expand distribution further after signing an agreement to open concessions inside home improvement chain Homebase. Bedroom, home and fashion retailer The White Company built out sales last year but profits fell because of upfront costs expanding two of its international businesses. Profits at the diversified interiors group Designers Guild Corporation fell in 2017–18 as higher costs negated the impacted of an increase in output driven by international revenue growth. Parlane has been delivering home accessories and gifts to trade buyers for nearly 50 years. Inset: Parlane co-directors Mike and Caroline Burgess. Kent furniture and interiors group Gallery Direct has agreed to buy Parlane International in a deal that combines two of the UK's biggest home accents supply brands. New hire at And So To Bed, the high-end bedding chain with stores nationwide. Sales fell, margins narrowed and losses widened at retailer Anglia Home Furnishings (AHF) ahead of the change of ownership that secured its future last summer. Rising online sales countered lower store activity at general retailer Next with its Christmas trading update underlining the widening channel shift at the furniture-to-fashion chain. Heimtextil launch for performance fabrics maker hoping to woo upholstery companies across Europe. Sleepeezee's Natural Collection has been named the inaugural winner of the Bedding Product of the Year category by Harvey Norman Ireland at the retailer's annual awards ceremony. John Lewis & Partners' home categories ended 2018 on a low note while fashion and electrical items meant the retailer's overall business closed the year out on a high. The winter sale period is well under way and the usual flurry of furniture-related adverts are promising benefits aplenty across British television screens. But something is different this year. Bedroom and living room cabinet maker and distributor Kingstown slipped to a 2017–18 loss after sales fell sharply at its largest business unit Consort Furniture, which supplies major UK retailers. Unrelated third-party buys assets of circa £42 million turnover operation. New one-size-fits-all mattress brand to drive international wholesale business for European bedding business. Leekes bought furniture retail business Coles of Bilston back in November 2009 with the tax treatment of accumulated losses remaining the source of a legal disagreement. A long-running tax dispute between Leekes and HM Revenue & Customs looks set to continue after the home department store retailer said it hopes to be able to appeal to the Supreme Court. Harrison Spinks today launches its first-ever television advertising campaign as the Leeds bed maker bids to drive customers into retail stockists' stores and ask for its products. Profits at West Midlands contract seating manufacturer Boss Design Group fell after expansion costs abroad offset the impact of higher sales. House of Fraser, which recently struck a deal for Sofa.com concessions to open in selected stores, has been trying to agree new terms with store landlords across its estate. House of Fraser has walked back plans to close its Hull store after striking a late-in-the-day deal with the property owner and Hull City Council. Ecommerce retailer MattressOnline is raising money for Crisis, a charity supporting homeless and vulnerable people, with the cash to be used to provide a bed for the night and meals this Christmas. Ad-fuelled mattress retail sales remained fractionally up year-on-year in November though growth was behind the year-to-date trend. Upholstery, carpet and cabinet retail sales were all down. Second year-end shortening for privately-owned multi-store upholstery manufacturer and retailer. Suffolk bed manufacturer invested in new assets against a backdrop of market uncertainty in 2017–18. Youth bedroom specialist The Children's Furniture Company hopes to expand its product offer, marketing reach and enter new markets after securing external investment that brings with it a new high-profile chairman. Mattress and ancillary products business Eve Sleep has enlisted the former marketing director at the Automobile Association (the AA) as its new chief marketing officer, after the previous incumbent left in October.